Lt. Gov. Dan Patrick seems to have a better understanding of the House than House Speaker Joe Straus has of the Senate. The Senate got to work on major legislation earlier than the House did — a common occurrence. But Patrick has taken as hostages two pieces of legislation that must pass, and on Wednesday, he gave a short address listing the legislation the House must pass to set those hostages free. Hostage #1 is the state budget for the 2018-19 biennium. It’s almost done, but it has to pass both the House and Senate in final form to become law. Hostage #2 is a dull bit of business called a “sunset safety net.” State agencies are reviewed periodically and have to be reauthorized to remain in existence. When lawmakers can’t agree on the reviews but don’t want the agencies to die, they put them in the safety net — a way of kicking the argument down the legislative road. Without the net, those agencies go out of business, so it’s a must-pass bill. 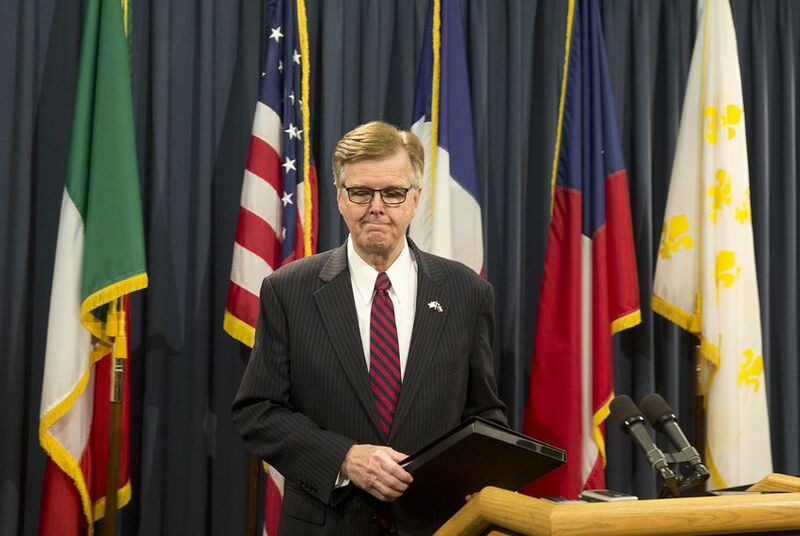 Patrick told reporters — reduced to stenography because he spoke and left without taking questions — that the must-dos won’t get done until he gets his way on two other pieces of legislation, one that would put the state in charge of regulating which public restrooms Texans get to use and another that would force local governments to hold elections when they raise property taxes by more than a set amount. Remember the Cold War movies where NATO and the Soviets would meet at German bridges in the middle of the night to exchange prisoners? This is like that. The lieutenant governor’s news lecture followed news of a letter to him from Straus, in which the speaker urged the Senate to pass the must-pass bills and avoid a special session. But unlike Patrick, Straus hasn’t offered an “or else” to back up his demands. He seems to be trying to appeal to the Senate leader’s desire for orderliness or comity, while underestimating Patrick’s desire to win — and the Senate’s superior position in this negotiation. The lieutenant governor has been trying to persuade the House to his side on property taxes and bathrooms since before the session started. Mr. Nice Guy has left the building. The third actor in this play seems to be on Patrick’s side. Gov. Greg Abbott told reporters earlier this week that property taxes and bathrooms are priorities for him, too. He wants a budget, of course, and the things he listed early in the session as his “emergency items.” He also said, as Patrick did, that there’s plenty of time for the Legislature to get all of its presents under the tree before the session ends on Memorial Day. The institutional differences between the House and Senate are critical here. Patrick is steering a more nimble vessel and can speak for the body he leads with more certainty. The Senate itself stands as evidence of Patrick’s formidable legislative abilities. No bill that makes it to the floor stands a chance of going down in flames. It’s no longer a deliberative body if the definition of that term is a place where big issues are argued and debated and the chips are allowed to fall where they may. In the Texas Senate, they fall wherever the lieutenant governor tells them to fall. Here’s an open challenge: Name a moment during the current session when they haven’t. The House has always been messier than that and much less likely to go in the direction a speaker — this one or any of his predecessors — wants to go. Straus knows that many of his members — a majority, probably — don’t want to vote on the bathroom bill. It’s got a practical flaw, in that it forces Republican representatives to choose between conservative businesses and conservative voters. They’d rather not. But Patrick knows that many of those Republicans would have to vote his way if pushed to vote in the open. That calculus worked in the Senate’s favor on sanctuary cities legislation earlier in the session, for instance. He’s just trying to force that vote — on bathrooms, on property taxes and perhaps, on other pet issues he listed as concerns on Wednesday morning. If the House won’t vote, he’ll shoot his hostages and come back for another chance this summer. If you can’t persuade them, force them. The House left an important bill in a dangerous spot, lost it, and might have created an advantage for their institutional rivals on the other end of the Texas Capitol. In a legislative process where so many issues die quietly in committees and parliamentary actions, making politicians attach their names to their positions can be a powerful thing. The "sanctuary cities" bill tested that theory.